Teflon® coating is by description the foremost recognisable term used to describe PTFE or industrial performance coatings. However, it must be remembered that Teflon® is a registered trade name belonging to Chemours™ and not necessarily a product in itself. Therefore the term Teflon® coating has many other attributes and meanings. The primary constituent of most industrial performance coatings is PTFE. Despite having some of its’ pedigree from the cookware sector, manufacturers have, over the past thirty years, made great advances to improve the formulations of coating where the main constituent component is PTFE and therefore it is a good reason to suggest that the term Teflon® coating is replaced by the term PTFE coating. With the revised term of PTFE coating now in mind, a larger family of coatings and applications can be explored within the pages of this website. Teflon is a trademark of Chemours™ used to refer to their non-stick products. While mainly being used as a trade name for PTFE, it is also used to market Perfluoroalkoxy (PFA, as "Teflon® PFA") and Fluorinated ethylene propylene (FEP, as "Teflon® FEP") compounds. Chemours's current range of coatings extensive and has been designed to meet most engineering challenges created by technology today. 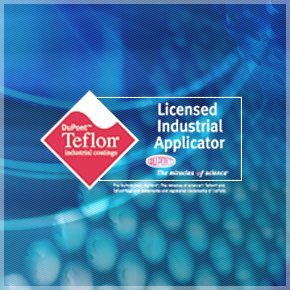 Chemours™ Teflon® industrial coatings are available in both powder and liquid. The versatility of these Teflon® coatings allows for almost unlimited application to a wide variety of part sizes and configurations, always adding value far beyond the inherent non-stick qualities. Teflon® industrial coatings spray on like paint and bake to a tough, inert finish. Over the years, Chemours™ technology has extended the family of Teflon® coatings to ensure a finish with the ideal combination of properties to meet most design needs. By combining heat resistance with almost total chemical inertness, excellent dielectric stability, and a low coefficient of friction, Teflon® coatings offer a balance of properties unbeatable by any other material. It is the original non-stick finish. Chemours™, the originator of Teflon®, has the worldwide resources to help you solve your coating challenges.